Nightwolf had been warned of the coming invasion of Earthrealm by a vision from Raiden. As such, he was fully aware and prepared for the events as they occurred, including the attacks of Kahn's extermination squads. His own homeland protected through shamanic magic, he would soon be joined by the other chosen warriors. Together, they then travelled back to the East Coast, prepared for battle against the Emperor and his minions, and won. 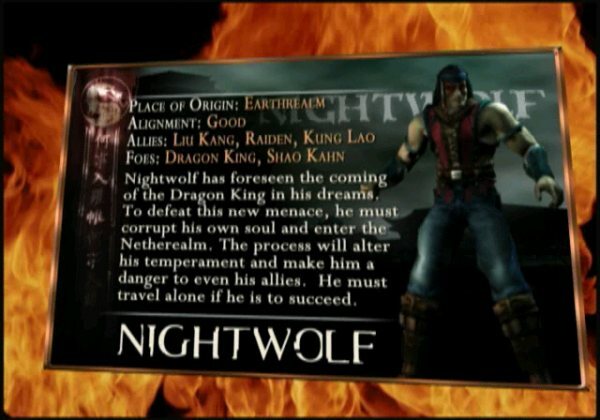 Nightwolf made his return during the events of Mortal Kombat: Deception. 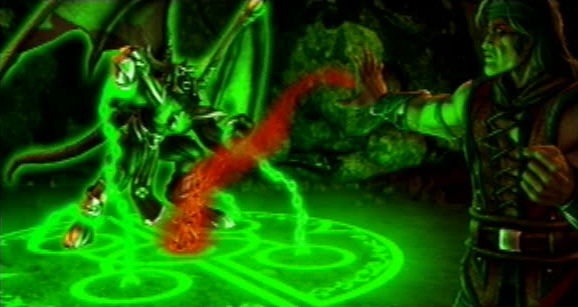 In the events leading to Deception, Nightwolf viewed images of the Dragon King and his resurrection in his dreams. These nightmares recurred constantly, and Nightwolf came to recognize them as a warning. He knew that a new evil threat was about to arise from the ashes, and in view of Reptile's transformation into Onaga, his predictions most assuredly came true. 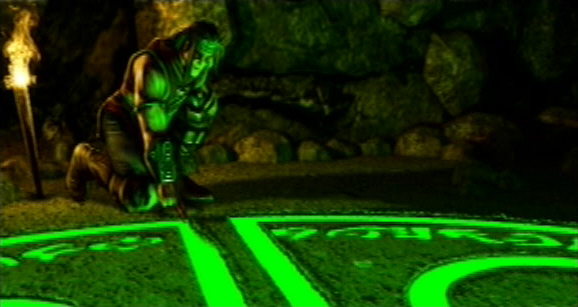 The method that Nightwolf would use to destroy Onaga was one passed down to him by his forefathers. This method was that of the "Sin Eater", which involved absorbing the sins of his tribe. However there was a terrible consequence to be considered in taking on such a role. If he were to do this, he would be a danger to all that surrounded him, including his allies. Hence, he made the decision to destroy Onaga on his own, keeping his allies out of harm's way. 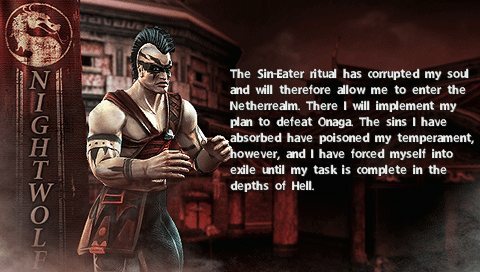 His role as a Sin Eater would involve entering the Netherealm, drawing Onaga's soul to him, and releasing the absorbed sins of his ancestors, which would bind Onaga to the spot. His method was successful and he managed to separate Reptile from Onaga, and bind the Dragon King to the Netherealm. After completing his quest, he was guided back to Earthrealm by his spirit guides - a pack of wolves. Nightwolf began to receive visions of a battle, where an unknown power was forcing the participating warriors to fight each other. His visions started to become reality, when he spoke with Johnny Cage and their allies, and agreed to assist them in battle against Shinnok and his forces. 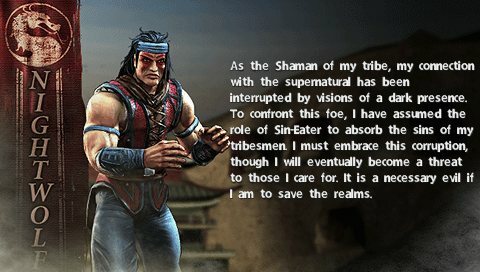 Eventually, Nightwolf was met by Kitana and the spirit of Liu Kang. The bond that the two of them shared was enough for Kitana to keep Kang's spirit whole, until a way was found for him to rejoin with his body. Still drained after using his shamanic powers on Onaga, Nightwolf used what magic he could to relieve Kitana of her burden, and took on the responsibility of looking after Kang's spirit. 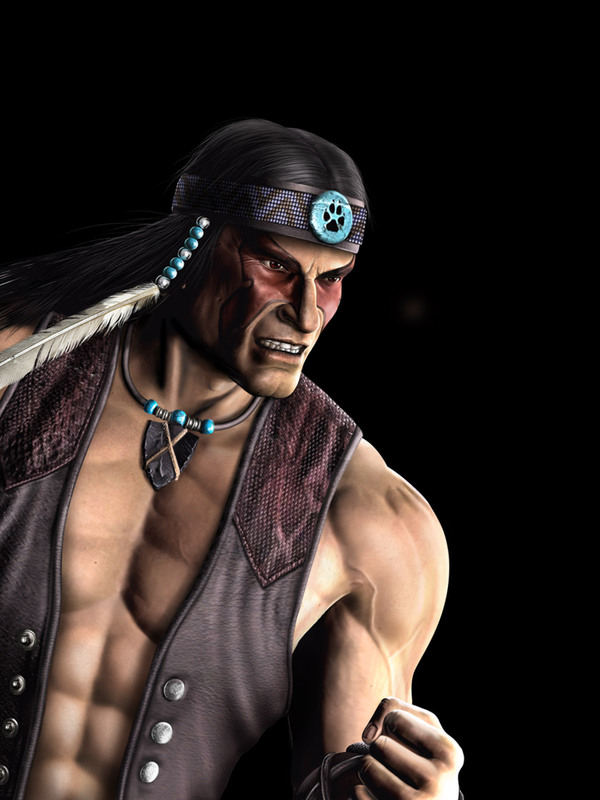 Most fighting game franchises feature at least one Native American fighter. 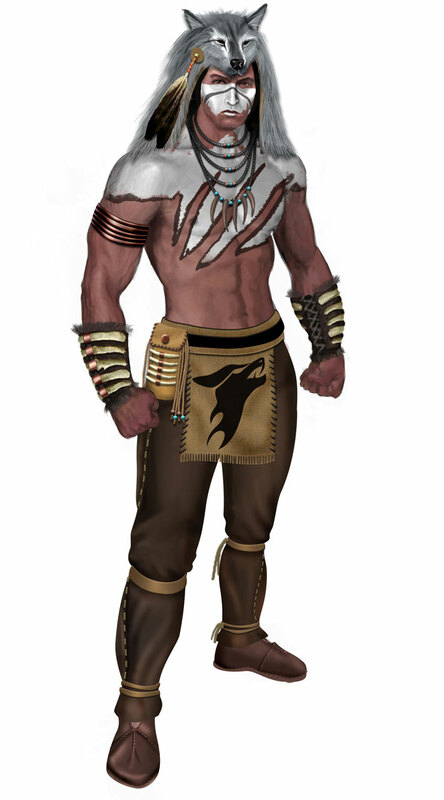 Nightwolf was yet another obvious "stereotype," but he was a fairly cool character for the series when he debuted in MK3. I don't think he was a "widely liked" character, but at least he offered some diversity from the typical "ninja-esk" MK characters. His original moveset was kinda bland, but not completely terrible I suppose. Nightwolf had practically zero personality for the majority of the series. 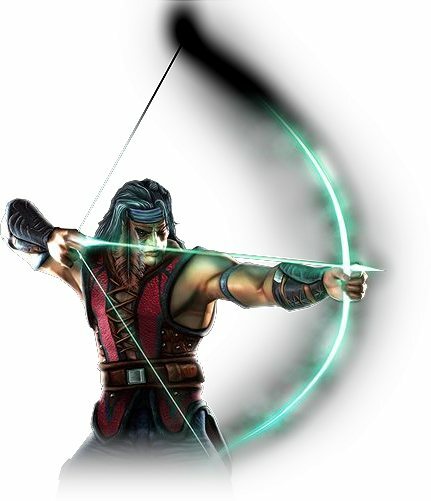 His appearances in the 3D era of MK games didn't do much for his design (besides make him look like a Chief Thunder rip-off with one of his alternate outfits), but his MK9 incarnation is easily his best to date. 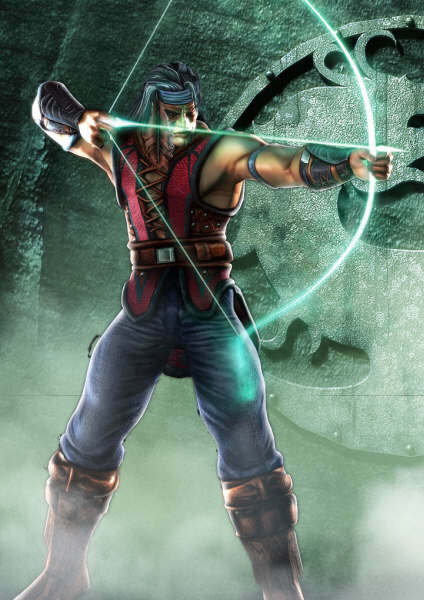 When they brought him back in MK9 he actually started talking, which helped flesh out his design... I guess he finally caught onto the language. lol. 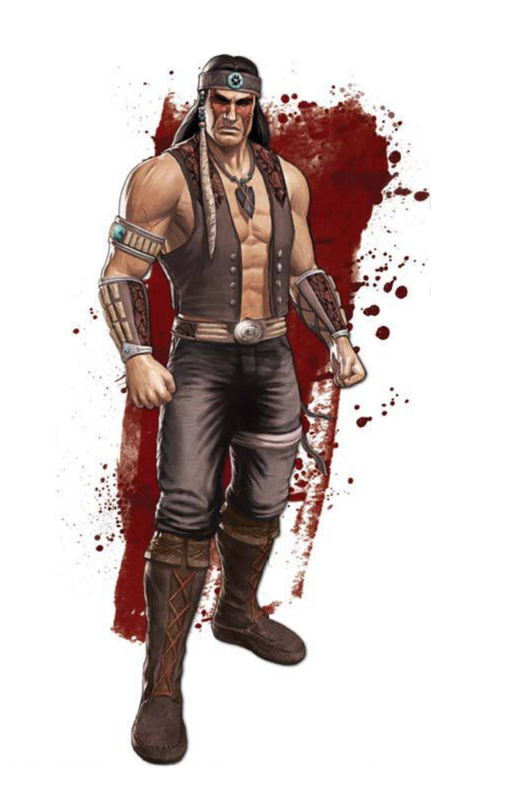 His MK9 moveset and overall appearance was also an improvement. It took about 15 years... but they finally got him right.